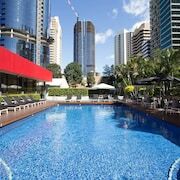 A stay at Four Points by Sheraton Brisbane places you in the heart of Brisbane, walking distance from Brisbane Botanic Gardens and Wintergarden. 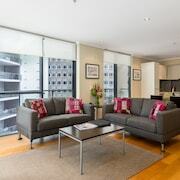 This 4-star hotel is within close proximity of Brisbane Riverside Markets and St. Stephens Cathedral. Make yourself at home in one of the 246 guestrooms featuring iPod docking stations and LCD televisions. Bathrooms with showers are provided. Conveniences include laptop-compatible safes and desks, and you can also request irons/ironing boards. You can enjoy a meal at a restaurant serving the guests of Four Points by Sheraton Brisbane, or stop in at a snack bar/deli. Quench your thirst with your favorite drink at a bar/lounge. Featured amenities include wired Internet access (surcharge), a 24-hour business center, and express check-out. Planning an event in Brisbane? This hotel has 3228 square feet (300 square meters) of space consisting of conference space and a meeting room.